Studies exploring the possibility of building a bridge across the Chesapeake Bay may have been conducted as early as the 1880s. The first known proposal came about in 1907 and called for a crossing between Baltimore and Tolchester Beach; other proposals, occurring in the years 1918, 1919, 1926, and 1935, also called for a bridge in this location. In 1927, local businesspeople were authorized to finance the construction of a Baltimore to Tolchester Beach crossing. Plans for the new bridge were made, but construction was canceled following the Stock Market Crash of 1929 with the collapse of the American economy and resulting Great Depression of the 1930s. Ferries were used as the main mode of transportation across the bay from the colonial period until the completion of the 1952 bridge. The first service ran from Annapolis to Broad Creek on Kent Island, roughly where the bridge is today. In 1919, the Claiborne–Annapolis Ferry Company began running ferries between Annapolis and Claiborne, a community near St. Michaels. A 1938 proposal by the Maryland General Assembly was the first to call for a bridge at the Sandy Point–Kent Island location. Although the legislation authorizing the new bridge passed, the involvement of the United States in World War II delayed the bridge's construction. In 1947, with the war over, the Assembly, under the leadership of Maryland Governor William Preston Lane Jr., (1892–1967), passed legislation directing the old State Roads Commission to begin construction. Ground was broken in January 1949, and after a ​3 1⁄2-year construction project, the bridge opened to traffic on July 30, 1952, as both the longest continuous over-water steel structure, and the third longest bridge in the world. Before the opening, a parade of vehicles made the first official crossing, led by then current Governor Theodore Roosevelt McKeldin, (1900–1974), and other state officials in a distinctive white Cadillac convertible flying huge American and Maryland flags. On November 9, 1967, the bridge was dedicated to Governor Lane, who had died earlier that year, and officially renamed the "William Preston Lane Jr. Memorial Bridge". In 1967, due to increasing traffic volumes, the Maryland General Assembly authorized three possible new crossings, all suggested during the 1964 Chesapeake Bay crossing study. These included one further north near Baltimore, one in southern Maryland, and an additional span to be added to the existing bridge from Kent Island to Sandy Point; ultimately, the third option was chosen. Construction of the new parallel span began in 1969 to the north of the original bridge, and it was completed on June 28, 1973. Because of its height, the narrowness of the spans (there are no hard shoulders), the low guardrails, and the frequency of high winds, it is known as one of the scariest bridges in the world, especially in higher tractor-trailer trucks. Several incidents related to the bridge have occurred. In some cases, these have caused significant closures and traffic congestion on either side approaching the bridge. The bridge has been closed four times due to extreme weather. The first time was September 18, 2003, during Hurricane Isabel and its high winds. On August 27, 2011, the bridge was closed to all traffic due to the impact of Hurricane Irene. Then-Governor Martin O'Malley ordered the bridge closed when sustained winds exceeded 55 miles per hour (89 km/h). On October 29, 2012, the bridge was closed due to the effects of Hurricane Sandy. On March 6, 2013, during the March 2013 nor'easter, high winds again caused the bridge to be closed. On August 10, 2008, a tractor trailer involved in a head-on collision near the west end fell from the bridge; the driver died in the crash. The incident has highlighted concern that the bridge may not be structurally safe, but the Maryland Transportation Authority (MDTA) has discounted any structural or engineering problems with it. Inspections of the wall in the weeks following the accident revealed that there was deterioration in the form of corrosion of the steel reinforcements inside barriers; this prompted immediate repairs to the wall. With shore-to-shore lengths of 4.33 and 4.35 miles (6.97 and 7.00 km), the two spans of the bridge form the longest fixed water crossing in Maryland and are also among the world's longest over-water structures. 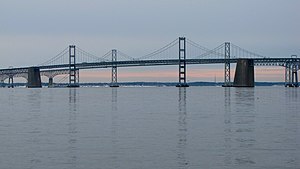 The bridge's western terminus is in Sandy Point State Park, located northeast of Annapolis in Anne Arundel County, and its eastern terminus is in Stevensville on Kent Island in Queen Anne's County. In 2006, pink markers were placed along the eastbound span to mark out the suggested following distance, similar to systems used in Minnesota and Pennsylvania. The markers are a part of the MDTA's "Pace Your Space" campaign to prevent vehicle collisions and traffic congestion due to tailgating on the bridge. In April 2013, changes were made to increase safety on the westbound span during two-way operations: signs, pavement markings, and rumble strips were modified, and a buffer zone between the left and center lanes was created. As a result, motorists can no longer switch between the left and center lanes, whether or not two-way operations are in effect. Operated by the MDTA, the bridge has a one-way toll (eastbound) of $4.00 for two-axle vehicles; vehicles with a Maryland E-ZPass pay $2.50. Previously the bridge had a one-way (eastbound) toll of $6.00 for two-axle vehicles (raised from $4 on July 1, 2013); vehicles with E-ZPass that were enrolled in the Bay Bridge Commuter Plan paid $2.10 (raised from $1 on July 1, 2013). The MDTA contracts with private companies to provide transportation across the bridge for nervous drivers (gephyrophobiacs) and cyclists; fees are $25 and $30 for drivers and cyclists, respectively. While there are no pedestrian facilities on the bridge, the Bay Bridge Walk and Governor's Bay Bridge Run used to afford an opportunity to cross the bridge on foot, usually on the first Sunday in May. The events took place on the eastbound span, which was closed to vehicles while two-way traffic shared the westbound span. Participants started on the east end of the bridge (on Kent Island) and proceeded west to the finish near the toll plaza. WMATA and MTA transit buses transported participants between outlying parking areas and the start and finish points. The run, a 10K race across the bridge, is held early in the morning before the walk. It is conducted by the Annapolis Striders, a local running organization, and controlled by the MDTA and Maryland Department of Natural Resources. Proceeds went to the Chesapeake Bay Trust in support of the bay. 2002 and 2007 due to poor weather conditions. 2003 and 2005 due to security concerns. 2008, 2009, and 2010 due to construction activity in the area on the west side of the bridge where participants would otherwise be staged. Fiscal concerns were also cited as a contributing factor to the 2010 cancellation. 2011 due to fiscal concerns. Following its cancellation in 2005, the MDTA considered decreasing the annual frequency of the event, citing traffic, fiscal, manpower, and security concerns. The most recent event (held in 2006) cost over $350,000, and the cost estimate for 2012 was almost $400,000. In late 2011, a non-profit group, the Greater Washington Sports Alliance (GWSA), approached the MDTA Capital Committee to propose sponsoring the event, along with a concert at Sandy Point State Park, at no cost to the MDTA. While the Capital Committee unanimously recommended that the MDTA Board approve the proposal contingent upon an agreement between the GWSA and the MDTA, the 2012 event was ultimately cancelled. After increasingly consistent cancellations of the walking event, the MDTA, along with Queen Anne's County, contracted with an outside company to have a professional 10K race across the bridge, which has been labeled the "Across the Bay 10K". The inaugural event occurred November 9, 2014. The Race Director is Dave McGillivray, who has served in that capacity for the BAA Boston Marathon since 1988. The Across the Bay 10K will have several charity beneficiaries, including bay research and restoration as well as breast cancer research and several others. Since its construction, the bridge has made significant impacts on both sides of the bay; among them has been the growth of Eastern Shore communities. When the bridge opened in 1952, and again when the second span was added in 1973, the Eastern Shore was given easier access to Baltimore and Washington, causing areas in southern Queen Anne's County to develop as bedroom communities. 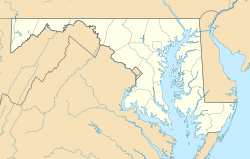 This extension of the Baltimore–Washington suburbs has led Queen Anne's County to be listed as part of the Baltimore–Washington Metropolitan Area. The bridge has also given easier access to Ocean City from the Western Shore, which has caused Ocean City to grow from a small town to one that is said to become the second largest city in Maryland during the summer. In 1948, the impending completion of the bridge gave rise to an extension of US 50 to Ocean City. The route was extended along the corridor of Maryland Route 404 (MD 404) and a large portion of US 213, cutting both of those routes back. During the 1950s, US 50 on the Western Shore was rerouted onto the long-proposed Annapolis–Washington Expressway (now known as the John Hanson Highway), which was built at the time in order to provide better access to the bridge. 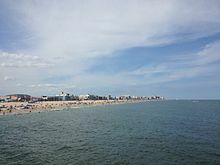 As the Eastern Shore, particularly Ocean City, grew, further upgrades and realignments of US 50 took place. This work included the aforementioned 1973 completion of the second Bay Bridge span, the extension of the US 50 freeway eastward to the US 50/US 301 split in Queenstown, and the construction of a freeway bypass around the north side of Salisbury in 2002. Additionally, the road has been upgraded and realigned over the years from its original two-lane configuration to a four-lane divided highway, with the last such section being in Vienna, bypassed in 1991. As of 2008, there are plans for further upgrades to US 50, including extending its freeway portion in Queen Anne's County to MD 404 outside of Wye Mills and replacing the aging Harry W. Kelly Memorial Bridge into Ocean City. The bridge is often the site of suicides by jumpers. In December 2004, a study concluded that traffic across the bridge was expected to increase by 40% by 2025. The following year, a task force formed by Governor Bob Ehrlich met to again explore the possibility of establishing a new Chesapeake Bay crossing. The task force concluded that a bridge would be the best option for an additional crossing, and four geographic locations for such a bridge were explored: Baltimore County to Kent County, Anne Arundel County to Queen Anne's County (the existing location), Anne Arundel or Calvert County to Talbot County, and Calvert County to Dorchester County. In late 2006, the task force released a report on the study but did not make a final recommendation; members of the task force requested additional time to continue the study. This page was last edited on 27 February 2019, at 18:06 (UTC).